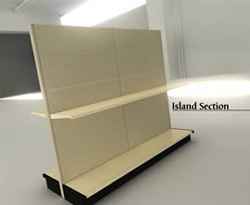 New Aisle Retail Display Gondola Shelving Starter Section - 16" Deep Each Side is perfect for all types of retail stores such as liquor stores, convenience stores, beauty supply and pawn shops to name a few. All units are complete with pegboard, base shelf, post with shoe, dust plates, feet and center supports. Upper shelves are adjustable. Upper shelves are sold separately. A manufacturer surcharge is not included in the pricing. Specs: 16" depth. Available heights are 48", 54", 60", 72", 84" and 96". Available widths are 36" and 48". 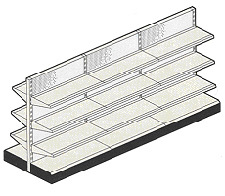 Notify me of updates to New Aisle Retail Display Gondola Shelving Starter Section - 16"